Hugo and Ross are two charismatic brothers whose curiosity has set them on an unconventional life path that searches for answers by attempting new quests which combine pioneering medical research and unique studies of historic expeditions. 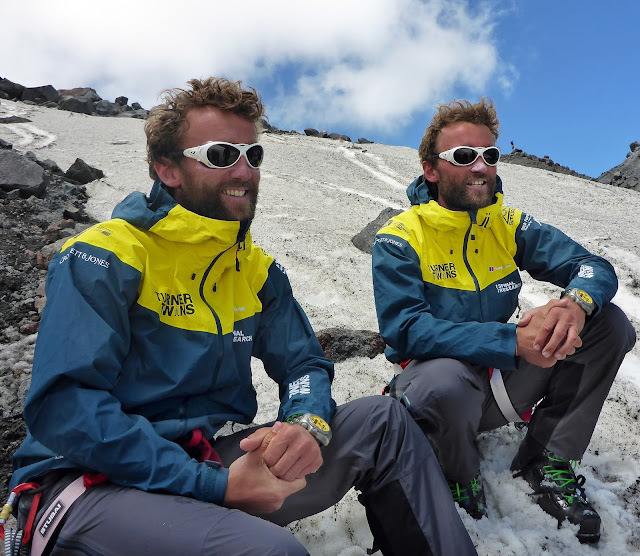 The twins’ adventure passion was ignited when Hugo was involved in a freak diving accident- sustaining a broken neck, aged 17. Three hospitals, a neck reconstruction and many months of recovery later, Hugo was back walking again. In the mix of emotions that followed this near catastrophic accident came an overwhelming drive to challenge themselves in the world’s harshest environments. They continue to use their expeditions as a platform to raise vital funds and increase the awareness and profile of various charities (Spinal Research in particular), organisations and sponsors. "It’s been a year since our (Turner Twins) last expedition to the Greenland ice cap and the failure of that trip still holds strong. Although I was excited to attempt Mt Elbrus, there’s still that thought in the back of my mind ‘what if we don’t make it’. How can I seriously carry on undertaking expeditions when I keep failing? This thought filled me with anxiety but also drove me to climb Mt Elbrus. A considerable worry was getting the clothing system correct as our Greenland expedition showed some serious errors in what we were wearing. All the scientific testing had been conducted on us (with some rather intrusive testing and prodding) prior to departing with the 360 team from London. Taking the Brynje kit into the temperature chamber (a chilling -20C) at GlaxoSmithKline’s Human Performance Lab, allowed a glimpse at how well it worked at low temperatures. We were being studied by King’s College London’s Department of Twin Research and GSK’s Human Performance Lab to better understand our physiological and psychological structure to help advance medical knowledge. We were also testing and comparing the clothing which mountaineers wore 100 years ago against today's modern equivalent. 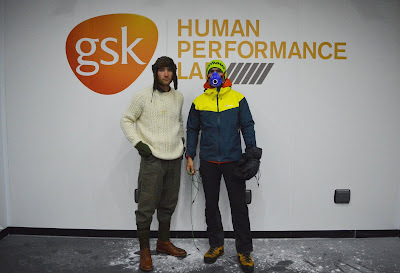 I (Hugo) would be wearing the traditional kit and clothing used by mountaineers 100 years ago while Ross was using the modern equivalent. Through our various expeditions and adventures we know that getting the clothing right can mean the difference between an enjoyable trip or, in extreme cases even failure. ‘Traditional’ wool base layers have always been the only option available to us so testing and using the Brynje mesh base layers seemed a good opportunity to evolve our kit system and measure how much better they could be. The climb started in the lowland pastures on Elbrus’ north side around 2,800m in reasonably hot temperatures (18C) and would take us to 3,800m above the snow line where temperatures and wind chill would be far less (around 0C). Wearing the traditional clothing system meant I had to wear the Brynje wool thermo layer while Ross, with the modern, would have to wear the synthetic Brynje Super Thermo – a great platform to test the new and old options. Admittedly they (Brynje base layers) feel weird to put on and look reasonably odd but I swear to you now that the performance rating of these base layers is beyond anything I’ve ever used before. Wearing the thermo base layer and a traditional silk shirt I never once over heated or became too cold even in the huge range of temperatures Elbrus through at us. There was one break where the wind picked up to about 15 -20 mph and everyone else put warmer clothing on. Not me, I was warm yet stayed ventile. 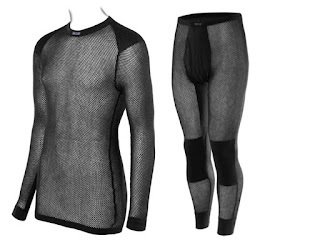 The advantage of using these base layers is that they keep you cool when you’re hot and keep you hot when it colder. Climbing to High Camp I didn’t need to change my layering system at all even though there were huge temperature changes. From High Camp to the summit I kept the same system – Brynje thermo base layer with a silk shirt. Only when it started getting into the double figures below freezing did I put a woolly jumper on. Yet even when I had this thick jumper on and I was working hard to climb this never ending mountain, I still didn’t over heat nor did I feel myself sweating. This was bliss. Ross in the new kit had the same feelings towards the Brynje clothing. He wore the thermo base layer with a wool mid-layer over the top and other than putting a micro down jacket on towards the top, be was blown away with the performance. 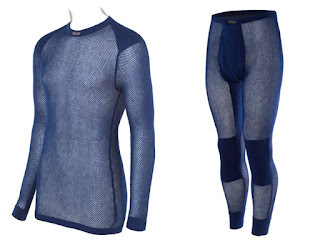 It’s all created due to the air pockets created by the mesh, thus decreasing the surface areas touching your skin allowing your skin to breathe and creating a ventile and lighter weight garment. Climbing Mt Elbrus was hands down the hardest thing I’ve ever done and there are things I’d do differently (but that’s another story) but the clothing system we used – both new and old – was the perfect combination and something we will both start to use on all our future adventures. Thanks has to go to NordicLife for advising us on the different kit systems. From working around our requirements to their knowledge of the environments we were going into, without their expert advice we wouldn’t have had as much success as we did"
We'll be following the progress of the Turner Twins as they take on their next challenge, and we'll continue to work with them to keep them warmer and dryer in our Brynje mesh.